One of the hardest things about doing any sort of training or workout is getting out there and just doing it. Then there's the pain for the first bit while your old and tired muscles take an age to warm up. Then there's the pain of the actual run or ride or swim or whatever, when you are just doing the work, god forbid an interval. Or when you have to climb that 17% hill. Then there is a slight euphoria after completing your workout. Then you sort of ache in strange places and want to eat much more than you should. Then you look at what is planned for tomorrow. Actually it's all pretty hard. Which is why some motivation is welcome. And that is where the social aspect of training platforms come in. I'm often surprised how this is ignored by new apps and developers, but it can be key to making a platform grow. Strava has clearly been the leader here, with a combo of "segments", grouping rides with others automatically, and making it easy to provide Kudos (essentially a "like"). Strava have indeed made recent efforts to rebrand themselves as the "No BS network", something I took as a dig against Facebook and Twitter, and an attempt to pull themselves alongside those giants. And it is motivational to think of the Kudos you may get during your workout, in fact I have often spent time doing just that ("just think of the kudos I'm gonna get Bwahahaha!") and what should I name it when I get back (I have learnt that a 30min run named "running off the hangover" is more likely to get kudos than a 3hr bike ride named "Morning ride" - and I guess it should!). Whereas Kudos is nice to receive, Strava also provides motivation in breaking records for segments (and getting a King of the Mountain or KOM for example), hitting PR's, and "Challenges" that you can join which provide a longer term objective (such as run 70km in a week). These used to come with the offer to buy overpriced gear and then spend a small fortune in shipping, coupled with import duty (at least for the UK) - so after completing that 70km in a week, I ended up spending about £60 on a low quality "exclusive" T-shirt that arrived 5 weeks later. Hmmm. Strava don't seem to offer merch' any more, but you can still subscribe to challenges and win virtual Trophies for completing them. Move (red) - this is Active Calories and the only goal you can set. Mine is currently 800 a day. Force press on your rings to change your move goal. You can change this at any time, but it sort of feels like cheating. However if I have completed 6 days with training every day then a rest day is appropriate, so I often feel like dropping the goal, but I don't, because, you know, it feels like cheating. Apple could improve this by allowing you to just add a comment to a day so that those you are sharing with don't respond inappropriately and understand that yes this is a rest day (or I am ill or injured, or travelling or whatever) and that's why my goal has dropped. Exercise (green) - this is minutes doing active exercise and is set to 30mins a day (which you can't change). If you are not following a structured training plan (where 30mins is a given), or if you are on a rest day then I think this is worthwhile, 30 mins isn't much and you can achieve it with walking. Really it should be the minimum everyone tries to do in a day. In the Apple Watch app on your iPhone, select Activity and you can toggle settings for Stand Reminders (useful), Daily Coaching (useful to in keeping you on track when you are close to closing a ring but not quite there yet for the day), and Goal Completions (I keep this on as well so I get a nice animation when I hit a goal). In addition you have toggles for Special Challenges and Activity Sharing Notifications, both which I discuss below. Cheating the system is interesting. I have seem some apps (not saying which) that let you log a manual activity, and write it to the Health app, which means you can close your rings without doing any actual activity. Apple should put a stop to this somehow. Not just because "you are only cheating yourself" but because Apple Watch can be used for health schemes such as the one from Vitality which awards points based on your activity from Apple Watch and then reward you with a monetary value (in this case essentially getting you an Apple Watch for free). I like these schemes because of the contribution to better national health, but if they can be so easily cheated they won't last. The bottom line is that if you can cheat on Apple Watch it undermines the whole platform and makes it less valuable, and Apple should stop it through App Review or technical restrictions. Apple Watch monitors activity through your whole day and not just for your activities. 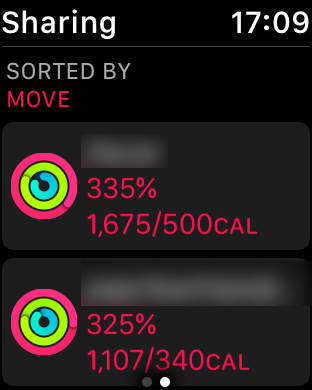 So if you perform an activity without actually starting an activity tracking app, Apple Watch will still record that in the rings (It does this by recognising certain activities automatically and calculating active calories for you - I'd like to know more about how this actually works, since it smacks of some Machine Learning magic...). This is a great feature (similar to Garmin Move IQ) and means you have much more holistic view of your health from the data Apple Watch captures. If you compare the ring system to the more widely use step count for day to day fitness tracking, this is considerably better; and I expect that there is a clear upgrade path for those counting steps to more to a device like Apple Watch. Delve deeper and into the Health App and you'll start to see additional metrics such as VO2Max, and HRV. In addition you can start tracking sleep (I am currently trying Beddit which Apple recently bought) and many other metrics. These are interesting and exciting and I'll be digging into them in more detail in a future post on the Health app. A bit like Strava (but not exactly), Apple Watch offers challenges for you to take. Unlike Strava you don't need to join the challenge, instead you are entered automatically, and the range of challenges is large and grows with you. Take a look at the Achievements tab in the Activity app on iPhone. You'll see a range of challenges with the simplest at the top ("First Cycle Workout") working all the way up to the toughest (mine is currently "Reach 1,000 Move Goals"). Throughout the year you'll also receive monthly challenges tuned to your performance (my current February one is Average at least 87 Exercise minutes a day which I'm somewhat behind due to a slow week this week). When you complete a challenge you get a medal - the quality of the graphics and the animations for the achievements is excellent, and you can spin your medals on both Apple Watch (with the Digital Crown) and iPhone. I get strangely comforted by seeing my name engraved on the back. That must be a hangover from the years of swimming at school where I managed to win a few races and grew a collection of medals and trophies, but we never got round to engraving them all. I have had some occasional issues with challenges, particularly the monthly ones which I swear I had achieved but they seem to disappear. This happened to me in October last year when I was chasing a move target of around 35000 calories which I hit on the last day but then swiftly disappeared. It's too much of a hassle to open a support ticket, but it does devalue the platform, and I have read others having issues too including one for the current Feb Special challenge - hopefully Apple will sort this out - perhaps with iOS 12 with it's reported new focus on reliability and bug fixing, though I'd prefer sooner obviously. Apple have created a simple way of sharing your activities with other Apple Watch users using iMessage and though there are some nice aspects to it, I have to admit that it feels half baked (well maybe three quarter baked, but its definitely a bit pale in some places). See below for details. You open the Activity app on iPhone and tap the Sharing tab. Tap the + sign at the top right and invite people to share activities. You can only invite friends who have an Apple Watch (which makes sense). In addition you have a hard limit of 40 people to share your activities with (which I have just hit) It's a shame because since publishing my details I have had a steady stream of people asking to share activity with me, and that will now not be possible, and 40 seems like a totally arbitrary number (I currently have over 70 followers on Strava for example). This may be a reflection on Apple wanting to keep this personal, and intending the feature to be used with close friends and other members of a club say, rather than publishing your details on the web. The invited use gets notified of the request and can accept it using the workout app or on Apple Watch. You'll see all your friends and their activity rings in the sharing tab on iPhone Activity app and in the activity app on Apple Watch. Tapping on a user will give you their rings in detail including their workouts and achievements (on iPhone) and simple data against targets for Exercise, Stand, and Move. You can be notified on Apple Watch when a friend closes all three Activity rings, finishes a workout or earns a reward. As you can see from just some of the notifications I have received today this can get a bit overwhelming when you have 40 friends on your list. There are no groupings of notifications for users so when Jay earns two awards I get two separate notifications and I have to tap into each one to get the details or respond. 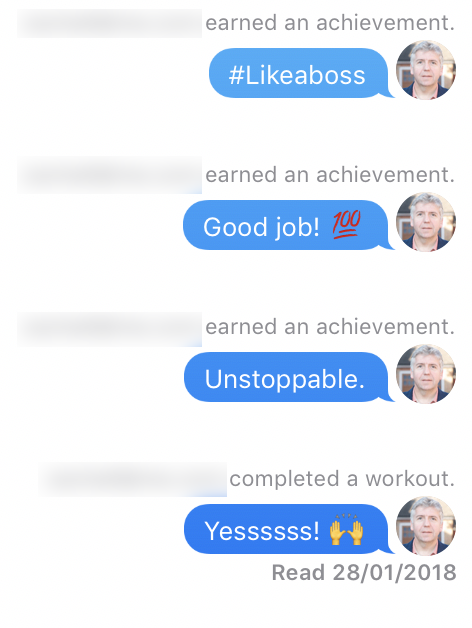 With multiple notifications the initial notification screen gives very little detail (just "earned an award", or "finished a workout"), so if I do want to heap praise or scorn I can't decide without an extra tap. Having the basic stats in this notification would help (you get these if you have a single notification from a single person) but grouping these by person and having an hourly or daily digest may be better, though at the expense of receiving immediate praise after a completing a workout (which is nice). I'm not sure of the best answer, but as it stands this system isn’t really working for me, and wouldn't scale to the sort of followers you would get on Strava or a social network. With a small group of friends it works much better though, and perhaps that’s Apples goal. Tapping Reply brings up the standard iMessage compose form on Apple Watch, but you are supplied with some pre-cooked responses such as "Way to get it done" (positive) or GMAB (I had to look this up too, it means Give Me A Break - so negative) for fast one tap responses. Each time you reply you get 6 of these pre-cooked responses, if you don't like any of them, tap cancel and then tap Reply again and you'll get a different 6. You can of course dictate, or scribble a response or send a emoji instead, just like in iMessage normally. These activity notifications are only shown on Apple Watch but if you open iMessage up on iPhone you will see your responses there with a nice black speech bubble with a workout icon and a workout summary. Cool. However If someone responds to your activity and is not in your contacts, and they have iMessage defaulted to send via a phone number then you get an orphaned message that you have no way of relating to the person in your friends list! Ouch! That sounds like an edge case but in reality it has happened a lot to me and has meant I have sent a lot of the messages shown in the screenshot to people who have responded to an Activity notification after I completed a workout but who I don't have contact details for. Again this is in part a reflection of the fact I have opened my activity sharing to the world and not just close friends, but hey, I sort of think that Activity sharing should have a better way of dealing with this. By the way if you tap on that black speech bubble with the workout summary, it will take you to the workout details in the app which is nice. If instead you want to do a tapback, just press lightly and hold for a second or so until you get that menu - it's a bit tricky (trickier than an normal tapback), but with practise it's possible. Just another nuance of the Apple interaction model. Another option available is “send message to all” - you can do this from the list of friends on iPhone or Apple Watch, however I’ve never had the guts to do so since it sends an message and shares everyone’s contact details with everyone else. Worse when I started to try it on iPhone the message was setup as an MMS not an iMessage - no idea why, but that could be a costly option and one I didn’t want to try. You can toggle notifications globally or on an individual basis. To toggle everything off (or on) In iPhone Apple Watch App select Activity and scroll to the bottom to toggle "Activity Sharing Notifications"; to do this individually, use the iPhone Activity app, tap the Sharing tab, select the person and scroll to the bottom to toggle notifications just for them. You can also use that individual menu to temporarily hide your activity with this friend, or remove them all together. I love Apple Watch, and have used it since the first version. However it's only since I started this blog and dedicated myself to using the watch for my IronMan Wales training that I have taken the rings seriously. Despite the quirks and issues detailed in the post, I am a fan, and they have certainly provided motivation when needed on quieter days in my structured training plan. Workout Sharing is a good start but again I'd like to understand if Apple intends to make this a bigger feature where activities can be shared and discovered by many more people, or if it is meant to be only used by a small group of friends, or members of a club, Currently the latter is the most appropriate use if it.